(Nanowerk News) Proteins and molecules assemble and disassemble naturally as part of many essential biological processes. 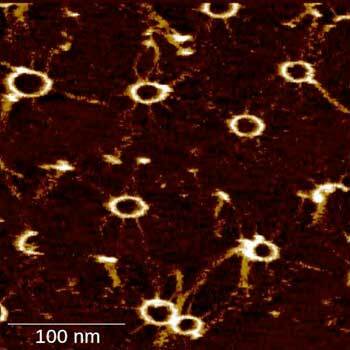 It is very difficult to observe these mechanisms, which are often complex and take place at the nanometer scale, far smaller than the normal visible range. At EPFL, however, an interdisciplinary team of researchers has invented and applied a technique that allows these mechanisms to be examined with unprecedented precision. Their work is the subject of a paper published in Nature Nanotechnology ("High-speed photothermal off-resonance atomic force microscopy reveals assembly routes of centriolar scaffold protein SAS-6,"). Using a new mode of atomic force microscopy, researchers at EPFL have found a way to measure protein dynamics in real time. Here is how the instrument is assembled. Nanometric structures can only be seen with specialty microscopes, such as atomic force microscopes, which were invented in the mid-1980s. These instruments create an image by physically “feeling” the topography of the sample with an atomically sharp tip at the end of a tiny cantilever. The sample is then scanned point by point to create an image. As this takes time, only static samples can be imaged with conventional atomic force microscopes. However, this is of no use when scientists want to look at minute samples that change over time, such as protein assemblies. Proteins assembling in real time. The researchers tested this new technology to analyze the dynamics of SAS-6 protein ring formation. This protein family plays a key role in the assembly of centrioles, which are minute organelles conserved from algae to men, fundamental for cell motility and division. As shown in the above video, the new instrument allowed the researchers for the first time to visualize the various stages of the ring assembly of SAS-6 proteins in real time.